We all have to go to the market to buy groceries and other stuff. One of the main reason we prefer that is, we can do bargaining and check if all the items are in good condition. For some people that is also a reason for an outing. But this is still the traditional way of buying stuff that needs to be changed. As most of the people are working now, they will not get time to buy grocery. So today I am writing an article mentioning top 5 websites to buy grocery online in India. 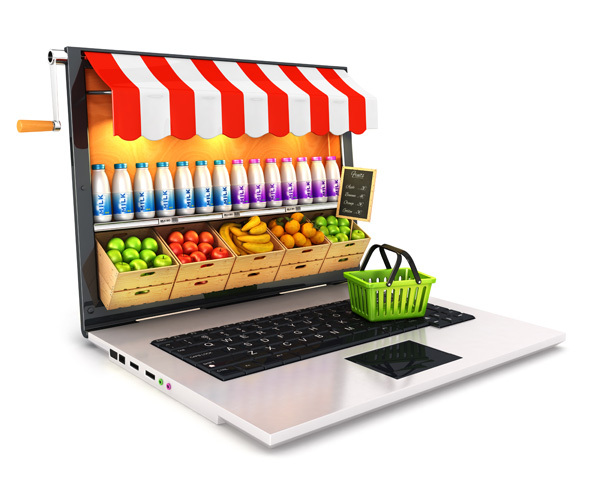 But before that we will see some of the advantages to buy grocery online. Your mom will often send you to the market/store to buy groceries and other stuff. So for me, it will be a boon if my family started purchasing grocery online. So the first reason to purchase grocery online is convenience. You just place an order and your order will be delivered at your doorsteps. The next benefit is that it will save a lot of time. In this time, you can do your other important stuff or maybe relax at home. Plus you get to see all the products available in the online store which is not the case with offline purchase. You can never ever guess what all products the offline store is selling until you irritate the shopkeeper. If you ask me, I will pay a bit more rather than go to the offline market/store to purchase what I want. If it’s 2 or 3 things then it’s a different case. I also see many people going to some famous stores like D-Mart where they offer huge discounts on whatever you buy. So I can conclude on this, if you get some discount plus good quality stuff online, then there is no harm in purchasing your groceries online. Zopnow has a fullscreen website design with the categories on the left and products on the right. It has small fonts with a bit congested product showcase but because of that, you can see many products on the same page. It has many categories apart from the usual kitchen category like bathroom, bedroom, kitchen, office, pet and cleaning. The most exciting thing to notice is they offer free shipping on all orders with no minimum order criteria. They promise to deliver within 3 hours of order placement depending on the location and availability of the item. The places where they deliver include cities like Bengaluru, Mumbai, Navi Mumbai, Thane, Hyderabad, Pune, Gurugram(Gurgaon), Delhi, Mysuru, Faridabad, Ghaziabad, & Noida. They have a funky way of calling the customer as zopper and they offer some online credits called zoppies which you can again use to buy products from their website. You also earn zoppies while you do some shopping and its very similar to a loyalty reward program. They also have a referral program through which you can earn more zoppies when you shop next time. Online payment and cash on delivery are two options for the payment. If you are doing shopping via mobile then they have a app for Android and IOS users to buy grocery online. The layout of the website is very clean despite they have a lot of items up for sale. There are various categories like Beverages, grocery & staples, baby care, packaged food, household, bread & dairy, personal care, stationery, cosmetics & pet supplies. On the right, you can see some combo deals & deals of the week. The products are presented in a very neat and clean way with a price tag on the website. They currently deliver in 17 states with different locations. Delivery is free for orders above Rs.499 and if it is less then Rs.40 is charged as a delivery fee. The order is delivered within 6 hours of order placement or you can also choose the order to be delivered in a particular time slot between 09 30 hrs to 18 30 hrs. If I choose my city then I can say they have a great reach in delivering their products to many locations. They accept payments with Debit/Credit cards along with Net banking, Cash on delivery, Sodexo coupons and even card on delivery. Cancellations are accepted for physical products and not perishable items until the order is not shipped. Bazaarcart has similar categories as Askmegrocery but they also sell International products, Ramdev Patanjali products, Ayurveda products, clothing and some electronics too. They deliver only in Delhi, Noida, Greater Noida & Ghaziabad. They also have Free delivery on order of Rs.500 and above or else they will charge Rs.50. They have a shipping period of 12-24 hrs after the order is placed. You can also tell them to drop your order with your nneighboror gatekeeper. They accept online payments in the form of credit card, debit card, net banking, Paytm, Mobikwik wallet, Cash on delivery, & gift voucher. You can also do a society registration with them to get some exciting offers. I also tried the live chat feature which works great but a bit slow response. Also if you wish to go only for dry product and you stay in Delhi, then you can head over to DilliGrocery too. They offer only one mode of payment i.e. cash on delivery to be safe. Mostly the deal in bulk orders so they have free shipping over Rs.3000. They have app only for Android users. They have a wide range of delivery location coverage in India. You can checkout the complete list on their website. The offline stores are present in Mumbai, Pune, Delhi NCR, Bengaluru & Hyderabad. The categories includes International cuisine, Health conscious products, confectionery & patisserie, and other common stuff. Other than that you also have shop by recipe option which is also great. To make things more exciting they conduct various cooking events in their nearest stores. The payment modes include online payment, cash on delivery, card on deliver, Paytm and other wallets too. In most cases they offer Free shipping but if you choose cash on delivery, Rs.40 will be levied as cash handling charges. They promise to deliver your order within 3 hours of order placement(conditions applied). I think this will be the most innovative website of all with events and shop by recipe option. They also have their own mobile app for Android and iOS users. This website also covers many cities and the list is given on their website. Apart from the usual categories they also offer fresh meat. There is a separate section for the offers they launch. The delivery options include same day delivery and you can also choose time slots. They only charge Rs.20 as delivery fee or if you place an order above Rs.1000 then its a Free delivery. They also have an app for Android and iOS users. The payment modes include online payment, cash on delivery, Sodexo passes only for food items. One more benefit of buying from these online store is, they use eco-friendly bags to pack your stuff. So these are some top websites through which you can buy grocery online in India. There are some other websites like Reliance fresh direct, kiranawalla, aaramshop, naturallyyours, Grofers etc. Apart from this you can always search websites that serve your locality. I really think people should buy grocery online or at least should give it a try once. If you have ever done it please share your experience below in the comments section.